Dallas / Maxim DS32khz TCXO in 14 pin DIP package. 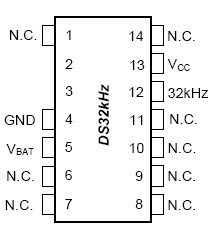 The DS32kHz is a temperature-compensated crystal oscillator (TCXO) with an output frequency of 32.768kHz. This device addresses applications requiring better timekeeping accuracy, and can be used to drive the X1 input of most Dallas Semiconductor real-time clocks (RTCs), chipsets, and other ICs containing RTCs.